Heritable. Many epilepsy syndromes have signature EEG traits, and these traits are thought to have a strong genetic component. The endophenotype concept suggests that using these epilepsy-related traits in genetic studies will facilitate gene discovery, a concept that has failed us so far in epilepsy research, unfortunately. Now, in a recent publication in Brain, we were able to demonstrate that variants in CHD2 predispose to photosensitivity, an abnormal cortical response to flickering light. Finally, after several decades of persisting difficulties, there is some progress in the field of EEG genetics. Schematic of CHD2 illustrating its functional (chromo, DEXDc, DNA-binding and ATP helicase) domains, the location of previously-reported variants and the unique variants in both cases and controls identified in this study (modified under a Creative Commons Licence from http://brain.oxfordjournals.org/content/early/2015/03/16/brain.awv052). Endophenotypes. Mentioning the word endophenotype in a group of epilepsy geneticists is guaranteed to produce a moment of awkwardness combined with a strange mixture of both excitement and disappointment. Let me take you back in history for a moment: the endophenotype concept for neurological diseases was first proposed by Gottesman and Gould in 2003. Endophenotypes should represent inherited, measurable traits associated with human disease that are closer to the genetic underpinnings than the actual disease itself. In cardiology, for example, the endophenotype of the long QT syndrome is an EKG feature. It is easier to do genetic studies with such a feature that can be measured in all individuals than with the broad range of clinical manifestations that may be associated with this feature. In epilepsy, it was the most logical step to look at the EEG as possible endophenotypes. Spikes and sharp waves. Common EEG features that we see in epilepsies include generalized spike-wave activity (GSW), centrotemporal or rolandic spikes (CTS), and the photoparoxysmal response (PPR). Various studies focusing on Idiopathic/Genetic Generalized Epilepsy (IGE/GGE) and Rolandic Epilepsy use this endophenotype for patient selection. Genetic studies in PPR managed to identify various chromosomal loci linked to this phenotype. However, identification of a causative gene in these regions remained elusive. PPR. A photoparoxysmal response is an abnormal cortical response to flickering light. In some individuals, particularly the occipital cortex is hyperexcitable, which leads to epileptiform discharges in response to flickering light. Depending on the intensity of the response, several grades of a photoparoxysmal response can be distinguished. In the most extreme case, intermittent photic stimulation (the technical term for flickering lights) not only generates a response on EEG, but triggers an actual seizure. While a photoparoxysmal response is very common, photosensitive epilepsies are very rare. Eyelid Myoclonia with Absences (EMA) is the prototypical photosensitive epilepsy, but other rare epilepsy syndromes may have a similar response. 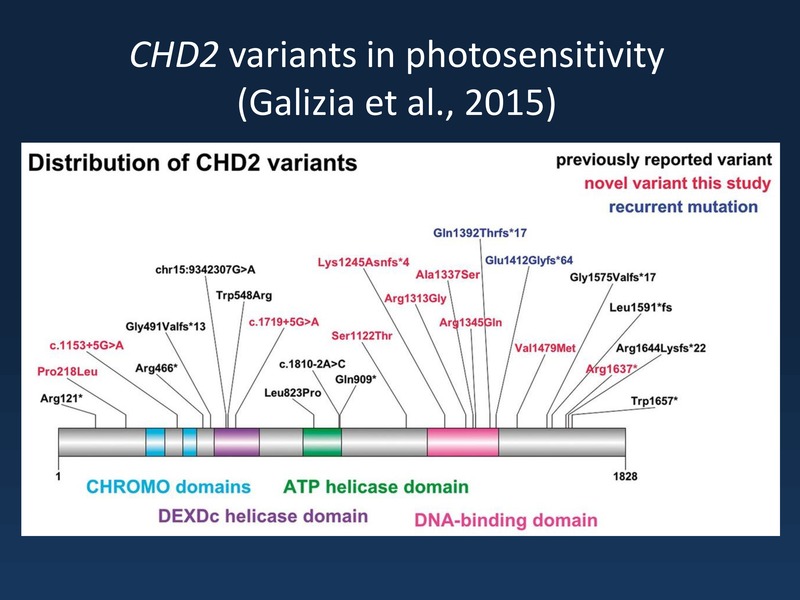 As patients with CHD2 encephalopathy are known to be highly photosensitive, we investigated whether rare variants in CHD2 could also be found in other patients with either photosensitivity or photosensitive epilepsies. Association. Using a cohort of 580 individuals with either photosensitive epilepsies or photoparoxysmal response, we were able to identify 11 unique variants in the CHD2 gene in the recent study by Galizia and collaborators. This represents a significant overrepresentation when compared to large exome control datasets. Many of these variants were either disruptive or predicted to be functionally deleterious, indicating a strong effect on CHD2 function. The phenotypes of the patients with these variants ranged from IGE/GGE with PPR, early onset absence epilepsy with photosensitivity, idiopathic photosensitive occipital epilepsy (IPOE), and a patient with PPR and febrile seizures only. To summarize, rare variants in CHD2 can be found across a range of epilepsies that have only one thing in common: an abnormal cortical response to flickering lights. Interestingly, such a response could also be observed in zebrafish larvae, pointing out that the mechanism underlying PPR in humans can be modelled in lower vertebrates. What you need to know. CHD2 is the first gene to be associated with the electrographic trait of the photoparoxysmal response. As in the case of SCN1A, our study follows the concept of trying to generalize the observations from an extreme phenotype (photosensitivity in CHD2 encephalopathy) to a more general trait (PPR). While our study was too small to demonstrate an association with CHD2 variants with PPR independent of photosensitive epilepsy, the broad range of phenotypes in patients with rare CHD2 variants may suggest this hypothesis. There is much more to be learned about the difficult genetics of EEG traits and the current study by Galizia and collaborators is a first promising step into this direction. Final comment. I feel that I should indicate that I am just one of the many coauthors of the current study that was masterminded by Sanjay Sisodiya in London. As common in our blog posts, we often highlight particular aspects of published studies, but are not able to fully reproduce the full content of the manuscript. In other words, there is much more to the CHD2 story that is worthwhile reading. I would like to thank all coauthors and would also like to emphasize that the publication is Open Access with CC attribution, meaning that you can reproduce from the publication as much as you want as long as you correctly reference the source. This is a very progressive way of publishing. From the perspective of our Kiel epilepsy genetics group, which has worked on the genetics of PPR for several decades, we were grateful to have our cohort of patients with photosensitivity included in this study. This entry was posted in 2015, autism, Consortia, Epileptic encephalopathy, EuroEPINOMICS, Familial epilepsies, IGE/GGE and tagged association study, CHD2, Dravet Syndrome, EEG, electroencephalography, EMA, EXAC, exome sequencing, Eyelid Myoclonia with absences, myoclonic encephalophalopathy, photic response, photoparoxysmal response, photosensitivity, PPR, rare variants, SCN1A. Bookmark the permalink. Please visit the CHD2 community at http://www.chd2.info to share your experience and finding.